Dr. Lisa Sowder - Seattle Plastic Surgeon, Achieve Your Personal Best! Are you a mother? Have you ever wondered if there is any way to restore some of your pre-motherhood babe-hood? Well, I'm a plastic surgeon and a mother of three and I'm here to help! Have you done your best? Let me do the rest! Those stubborn bulges are often not responsive to diet and exercise. Plastic surgery can help you achieve your personal best. Do real men have plastic surgery? Oh, yeah. And I'm very comfortable with the male plastic surgery patient. My dad, my husband, all my siblings, two thirds of my offspring and my cat are dudes. Only you can decide is breast implant surgery is right for you. Consultation with me includes "trying on" implants to see what size will enhance your overall figure. Bring a snug t-shirt or borrow one of ours! Start by looking for a surgeon who is certified by the American Board of Plastic Surgery. This assures your surgeon has trained fully and formally in an accredited plastic surgery residency program. Take a long look at my web site. By the time you are done, I think you will have a good idea about my approach to plastic surgery. If you think we might be a good fit, call to set up a consultation. Have you finally made friends with your scale? Congratulations! If you have been left with sagging skin or a few areas recalcitrant to your weight loss, body contouring can help. Think you are "too old" to benefit from breast or body contouring? If you are in good health, think again! Hi! 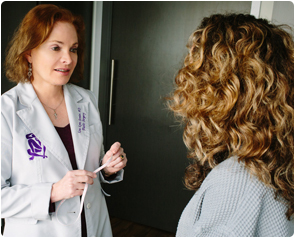 I’m Dr. Lisa Lynn Sowder and have been a plastic surgeon in Seattle, Washington since 1991. Come on in, pull up a chair and stay a while. Learn what plastic surgery has to offer to help you achieve your personal best. Take a look at the variety of procedures I perform on an amazing variety of patients. You will see why I never have a boring day in the office or the operating room. If you are looking specifically for a lady, woman, or female plastic surgeon, I certainly qualify! If you would like to meet me in consultation, give my office a call. I’m looking forward to meeting you. You can meet me on YouTube. As of 2014, I have moved to a beautiful new office with an attached state of the art outpatient surgery facility in the Madison Tower on Seattle’s First Hill. My new address is 1101 Madison Street, Suite 1101, Seattle, Washington, 98104. My new phone number is 206 467-1101. My new fax number is 206 812-4344. My new email is sowder@sowdermd.com or lsowder@madisonplasticsurgery.net. You can use either one. Read Dr. Sowder’s expert answers on RealSelf regarding mommy makeovers.